I love Doujin fighters and not too many people talk about them. Here's my review of a game I've been playing for a couple of years; BigBangBeat. Maybe it will get some of you interested in doujin fighters. 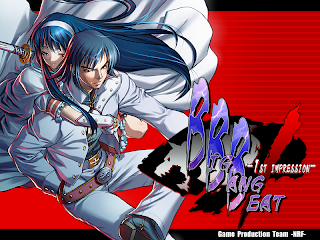 If you aren't familiar with Doujin fighters, they are fan-made fighting games that for the most part you can download for free online. A lot of them are actually pretty good and some are turned into official games (Like Melty Blood). Unfortunately many doujin's don't work well or have sketchy fighting systems. I bring you my review of one of my favorites: BigBangBeat- 1st Impression. A PC game.